A small incision (cut) is made, most often on the left side of the chest below your collarbone. The pacemaker generator is then placed under the skin at this location. The generator may also be placed in the abdomen, but this is less common. 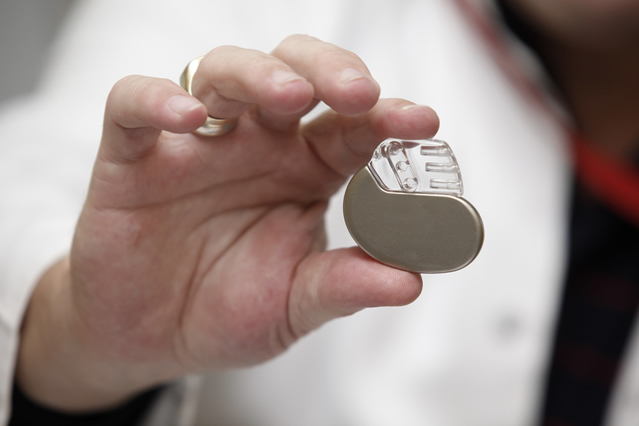 Two kinds of pacemakers -- transcutaneous and transvenous pacemakers -- are used only in medical emergencies. They are not permanent pacemakers. When your heart beats too slowly, your body and brain may not get enough oxygen. Symptoms may be light-headedness, tiredness, fainting spells, and shortness of breath. Most biventricular pacemakers implanted today can also work as implantable cardioverter defibrillators (ICD), which restore a normal heartbeat.